Now that we are well into the 21st century, it's not too often that one gets to drive something completely new and original. After all, the internal combustion engine has been around for 136 years now and even electric cars have been on the road for over two decades. So when the chance arrived to drive a vehicle Renault has been touting as the future of inter-city commuting, that too in Ibiza, I was ready to brave anything, a long convoluted flight plan and even the possibility of not being able to fit in the car. First shown to the world in concept form at the 2009 Frankfurt Motor Show, the Twizy is a part of Renault's electric vehicle line-up. Sparkling in the Ibiza sunshine, the production spec of the Twizy still looks like it has been teleported back in time from the Jetson's garage though some of the space age design elements we saw on the concept like the square wheels have been sacrificed at the altar of practicality. Officially classified as an electric quadricycle as per European regulations, it comes in two versions, the standard Twizy 80 - a heavy quadricycle (max speed 80kmph) and the light quadricycle Twizy 45 (max speed 45kmph and doesn't require a license in Europe). At just over a metre in width and under two metres in length, with a high stance and four outboard wheels, the Twizy looks like nothing else you have ever seen on the road. It's built around a tubular frame with body panels attached. The battery is stored low under the driver's seat to lower the centre of gravity. Designed to be open to the elements with no windows (even the nifty scissor doors are optional extras) the Twizy was built to offer owners the convenience and ease of use of a scooter while also providing the comfort and safety of a four-wheeler. The cabin has two tandem seats (passenger behind driver) and a simple user interface. A steering wheel, borrowed from the Laguna, is positioned in the centre of the dashboard, regular brake and accelerator pedals, a simple LCD screen above the steering that displays range, speed and distance to empty, a drive select switch, regulation indicator stalks, windshield wiper, a key and even two glove boxes (3.5-litre on the left with a 12V charging point, lockable 5-litre box on right) and an additional 40 litres of storage in the boot placed behind the passenger seat. The Twizy is available in three trim levels, Urban, Colour and Technic with the top of the line Technic spec getting the white piped seats, special alloys, fake carbon cladding and a clear Perspex roof. The driver's seat is quite spacious, even for my 6'8" frame and once you figure it out, it's quite simple to negotiate the scissor doors to get in and out. The passenger however will be a bit cosy, tucked away in the back of the survival cell. The Twizy is powered by a 13Kw (17PS) electric motor that uses lithium battery technology similar to the Nissan Leaf and delivers drive to the rear wheels. It takes a full 3.5 hours to hit full charge from empty and delivers a max range of 100km, though Renault's engineers are quick to suggest that 70-80km is a more realistic target. If subjected to 'sporty' driving, that figure should drop to around 50km. The Twizy also uses regenerative braking (like F1 cars) to top up the battery whenever possible. Driving off is a simple affair, turn the key, select drive or reverse, release the parking brake and hit the 'gas'. After a small lag, especially when you mash the throttle (engineered in by Renault to ensure safe starts) the Twizy builds up pace quickly as all of its torque is available all the time. Renault claims a 0-45kmph time of 6.1s. Pick up the pace and the Twizy feels a lot like a go kart, rear wheel drive and direct unassisted steering allied to an ultra stiff chassis. After a few tentative tries, I had a lot of fun flinging it into corners, never once having a scary moment. The downside of the stiff suspension is that over even slightly broken roads (there is a lot of that in Ibiza) the ride is quite harsh. So how would it be living with the car? 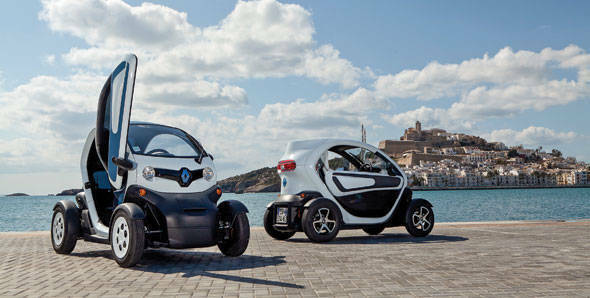 Renault is clear that the Twizy does not need a government subsidy to be economically viable in Europe. Over and above the Rs 4.9 lakh to Rs 5.6 lakh price, buyers are required to sign up for a battery lease contract (starts at around Rs 3000 for an annual distance travelled of 7500km). Renault is targeting a young, fun and upwardly mobile buyer for the Twizy having roped in DJ David Guetta and his wife Cathy to act as brand ambassadors. In Europe, the Twizy costs as much as a Hyundai i10 and if you live in a big city, it is actually a good second option for short trips but it will be a while before we see one darting through our streets. Renault will first need to make it monsoon proof and then there's the matter of that stiff suspension and our 'brilliant' roads!